If you’re looking for a unique and precious gift to give to someone this Valentine’s Day, you should definitely consider something from The Friendship Stone. I continue to be re-impressed by their generosity and integrity every time that I visit their website, and was delighted by the review product sample they sent to me. The Friendship Stone began when the company’s founder visited South Africa and came across the Tiger’s Eye stone. She then began passing them out to others as a tangible way to express friendship, love, and support, and thus The Friendship Stone was born. 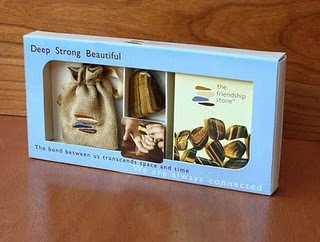 Today, the company offers stone gift packs, jewlery, and even a Friendship Stone game. 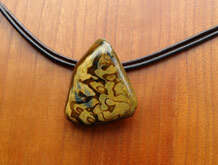 Each product, of course, features a unique and beautiful Tiger’s Eye stone. Discovered in large quantities in Western South African soil in the 1880’s, the Tiger’s Eye is a semi-precious gemstone displaying an effect of a thin band of light, called Chatoyancy, that changes position as the stone is turned back and forth. The Tiger’s Eye is made up of crystal deposits of quartz and a fibrous blue mineral called crocidolite. While in the earth, these crystals condense simultaneously from hot-mineral rich fluids coursing through tiny cracks in the rock that grow and fill it1. The combination of the two crystals as well as the crocidolite fibers help form the Chatoyancy effect the Tiger’s Eye is well-known for. The Friendship Stone is meant to serve as an important reminder of the bond of friendship. The ability of the stone to change with the rays of light is an important message for how one chooses to view life and friendship. Just like the stone’s appearance changes, the Friendship Stone symbolizes the power of choice, of positive thinking and of one’s ability to alter direction in life. The structure of the stone is as beautiful, distinctive and irreplaceable as the people that comprise one’s life. The stone, small-enough to be permanently carried around, serves as a constant trigger to the importance of each individual in our life. By giving the Friendship Stone, one provides a keepsake, an everlasting sign that regardless of location, there will always be an enduring connection between those two particular individuals. First of all, I love the concept of giving someone a tangible way to provide support and encouragement. I was sent the Friendship Stone Individual Pack to review and found that the stone is absolutely beautiful and the packaging done well with a small bag to hold the stone and an explanation booklet included. I had planned to keep the gift pack for when someone needed a special nudge of support, but my daughter got to it first and was equally mesmorized by the stone, even as a 14-month-old girl. It’s fine, though, because I was hoping to give it to her anyway when she was a little older. 🙂 You won’t be dissapointed by the stone’s quality or beauty. It surely is unique and beautiful, providing a great example of how individuals are also beautiful, unique, and strong even in times of adversary! The second thing I really like is that this company supports a lot of great causes. They have partnered with Big Brothers and Big Sisters of America to give back 20% of their profits gained from this site, and also donate 10% of their general proceeds to Project South Africa (to support the communities where the Tiger’s Eye orginiates). Enter the code “Valentine” to receive 14% off on the complete line of Friendship Stone Gifts and Jewelry! Search through the rest of their website to find other great deals (like 20% off of all necklaces). Review is based on free product sample provided by The Friendship Stone. No other compensation was received. I entered the Alex and Ani jewelry giveaway. I entered the BedVoyage giveaway. I would love to win this to give this as a gift to my best friend. I would love to win this so I could give it to my BFF for her birthday. This would be such a memorable gift for her. I entered the BedVoyage Blanket giveaway. I entered the Pacific Jewelry giveaway. I entered the Alex and Ani giveaway. I'd like to win this because it would make a unique gift for my best friend. I would like to give this to my daughter, she is my best friend. Just found your site. Very nice pictures and fun looking jewellery.